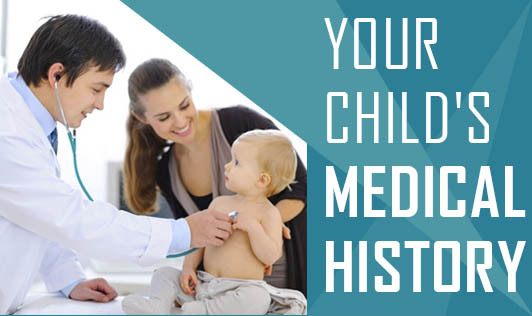 In case of an emergency concerning your kid, the medical faculty at your child's school would need to know about your kid's medical history. This can include drug allergies, intolerances and food allergies that your child has. In an incident that can be harmful to your child, this kind of a record of your child's medical history would come in handy. This information can help a medical professional make quicker diagnoses and decisions during an emergency. • Emergency contact number and date of the last physical examination. • Your child's current height and weight. • A current medication list. • If your kid has any known allergies, then this information needs to be written down on the medical history form as well. • A history of illness in your family. • Names of drugs, dosage amounts and the reason for taking them. All this information can usually be found on the package or bottle. • Non-prescription medications should also be noted on the medical history document. For example, supplements, diet pills, herbs, pain relievers and cough medicines should all be listed if they're taken with any kind of frequency. • Laboratory and other reports that have been done in the past. • A record of your child's immunizations. • It's important that you try to compile an accurate list of dates for these events (food allergy, intolerance or drug reaction). • Records of hospital discharge summaries, emergency department visits, home health nursing reports, and physical therapy reports should be maintained. • A doctor will also find it useful if you include all health milestones, including major surgeries, tests or treatments and medical problems. • Another tip is to update this information whenever you visit a doctor or the emergency room. Some hospitals have computerized medical records that keep all medical information about a patient in one place. So when you get to the hospital, everything about your child's history will be available. But, it's still a good idea to update your child and family's records as it would save time for the doctor to decide on the next step to be taken in case of emergencies.